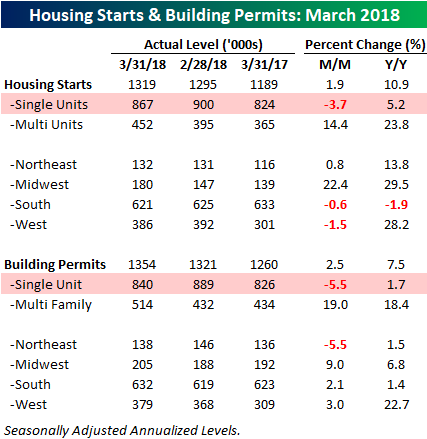 Data related to Housing Starts and Building Permits for the month of March came in stronger than expected earlier today. Housing Starts for March came in at a seasonally-adjusted annualized rate of 1.319 mln compared to expectations for a rate of 1.267 mln, while Building Permits hit a rate of 1.354 mln, which was 33K greater than forecasts. In the case of both data series, March’s readings were just shy of the current cycle’s highs, but still well in the hole compared to the peak run rate of over 2.2 mln during the last expansion. While the headline data was strong in both reports, underneath the surface the trend wasn’t quite as positive. The table below breaks down both reports by size of unit and region. 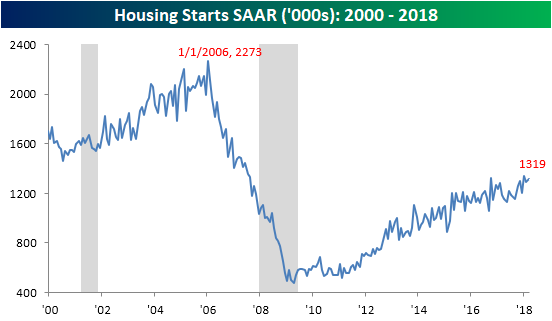 The key thing that sticks out in both reports is that single-family units actually declined on a m/m basis with a drop of 3.7% in Housing Starts and a decline of over 5% in Building Permits. Multi-family unit starts and permits, however, were up by double-digit percentages. 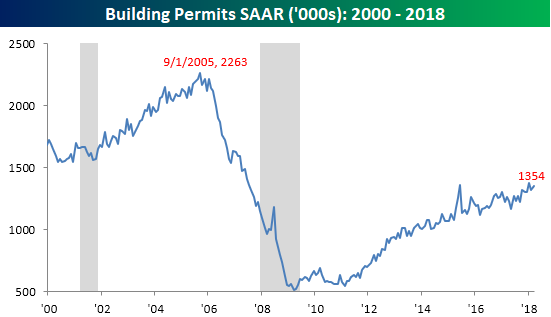 On a regional basis, the Midwest was the strongest m/m in both starts and permits, while the Northeast was the only region to see a m/m drop in permits. All in all, it would have been preferable to see a stronger showing from single-family units, but the longer term trend for housing remains solid.